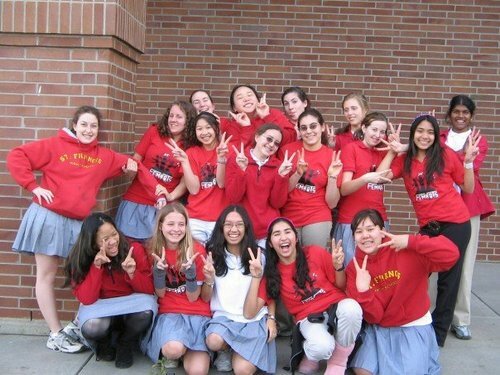 My freshman year in high school, I joined our FIRST (For Inspiration and Recognition of Science and Technology) Robotics Competition (FRC) team, and I became addicted to FIRST. 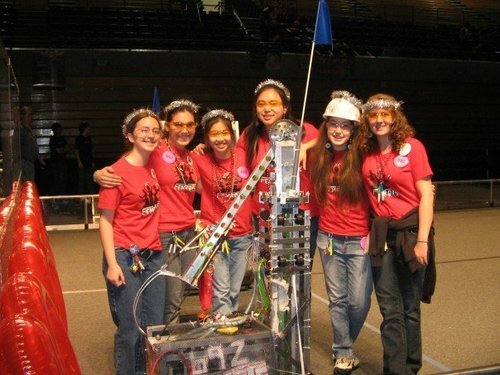 I went to an all-girls high school, so we had an all-girls team, called the Fembots (Team 692). Our team was small but super close-knit; I was soon adopted into the family of the people who would become my best friends and inducted to a new culture. This new culture is the culture of FIRST. FIRST was founded on the ideals of gracious professionalism, inspiration, and the idea that every participant could become a professional in the field of engineering. This is accomplished by a robotics competition where FIRST creates a game challenge which is released at Kickoff in January, gives teams some parts and 6 weeks to design, build, and program a robot, and then teams play the game in teams with other schools at regional competitions. Teams have professional engineers as mentors, and the veteran students help teach the new ones. My freshman year, I joined the build team, where I learned about design, how to use tools and machines like the band saw and drill press, teamwork, and time management (those 6 weeks go by way too fast!). My first competition was an unforgettable experience. The goal was to make competition every bit as exciting as a sporting event, and they succeeded. There is music, screaming and cheering as people support their teams and alliances, mascots and dancing, students decked out in their team's colors, a crazy MC with blue hair, and 120-pound, 5 foot tall robots playing 2-minute matches, 3 robots against 3 robots. I was on the drive team and pit crew, which meant I was one of the people remote-controlling the robot during the matches and hurrying to fix the robot between matches. Competitions are some of the most intense, fun, and amazing 3-day experiences of my life. My sophomore year, I was much more involved in the design process, and had to figure out how to make parts instead of always being told what to do. Then my junior year, I became one of the co-captains of the team. At this point, I was completely addicted, and wanted to share FIRST with anyone and everyone. With the help of our mentors and my co-captain, we expanded the team's activities to include mentoring middle school FIRST Lego League (FLL) teams, running an FLL competition, making more presentations to sponsors, starting a monthly newsletter to keep sponsors and alumnae informed, being interviewed on the radio and TV stations, hosting a full-scale practice day for other teams, and taking any opportunity to demonstrate our robot to spread the word of FIRST. I suddenly had to learn business skills, public speaking, people management, organization, and leadership. Luckily, all our hard work paid off, as we won the Chairman's Award that year. 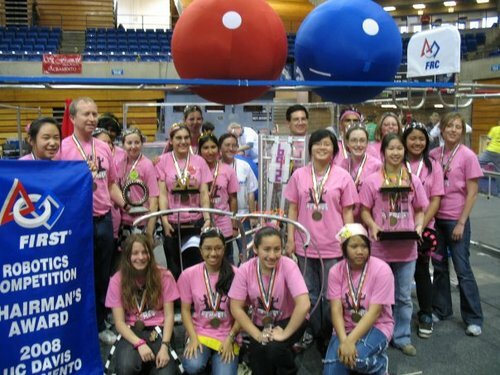 In order to keep the culture of FIRST centered on this ideas of gracious professionalism and inspiration, the Chairman's Award is the highest honor a team can receive, and it has nothing to do with the robot; it is all about community outreach and spreading inspiration to study math, science, and engineering. This earned us a spot to the Championship competition, held in Atlanta, Georgia in the Georgia Dome. Regional competitions usually have around 50 teams; the Championship has 340, and that's just at the high school level; it is the Championship for all the levels of FIRST, so there are 100 FLL teams from all over the world, plus 100 FIRST Tech Challenge (FTC)teams (it's a smaller scale robot also for high school kids). There are 4 FRC fields, 2 FTC fields, and 6 FLL tables running simultaneously, and the Dome is filled with 25,000 kids excited about math, science, engineering, and robotics. The energy and enthusiasm is incomparable. It was in Atlanta that we had dinner with the crazy blue-haired MC, who happens to work for NASA Ames, and he offered me my internship in the Robotics Academy for two summers. Fueled by my excitement from that trip to the Championships and the successes of the whole year, I was determined to make my senior year even better. It was a challenging year, as our team had shrunk to only 13 members, but I wasn't going to let that stop us! We started a project to form more FLL teams in the greater Sacramento area. That year, we started and mentored 2 new teams, as well as continued to mentor the one from the previous year. We continued to run the FLL competition. We made more presentations, got more sponsors, demonstrated at 2 Girl Scout events and a NASA Ames Family Night, and hosted a STEM (Science, Technology, Engineering and Math) Fair at our school where we invited 40 companies to have booths and share career possibilities in these fields. Normally, Kickoff (the start of our season) was held at UC Davis, but they decided not to stop hosting it, so I decided we should host a mini-Kickoff because it's more fun with more teams. We invited the local teams, and 4 other teams joined us. There was a new team in town, so we mentored them throughout the 6 weeks. We hosted our annual practice day as well. I was also serving as Head of the Build subteam, so between that and my co-captain duties, it was a stressful but fun 6 weeks. We also got to go back to the Championships again, which was amazing. One of the last things I did as co-captain was sign up the team to have a booth at the California State Fair (luckily, the Fair was before I was leaving for college, so I was still there to run that). We brought 2 robots, let people of all ages try operating one of them, and talked to everyone who walked by and would listen - nearly 9,000 people by the end of our 7 days there! FIRST has truly helped shape me into who I am today. I am majoring in mechanical engineering largely in part to my fabulous experiences designing and building those robots. I have a love of sharing this passion with younger kids, developed through mentoring FLL teams. I am still doing this in college, where I am part of a group dedicated to exactly that. It has also led me to consider teaching and the education aspect of engineering, which led me to being a physics camp counselor summer of 2010 and my 2011 summer research experience. 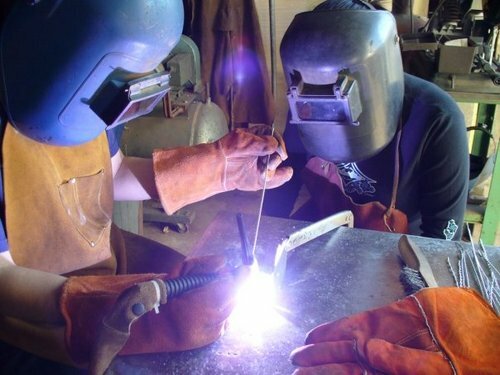 It allowed me not only to learn how to weld and use tools to build a robot, but to use effective teamwork and leadership. I am comfortable giving presentations and doing public speaking because I had to give presentations to companies and interviews to TV stations. I learned about budgets and money-managing skills on a much larger scale than normal high school clubs, how to deal with people in high-stress situations, and how to deal with guys who still hold they stereotype that they are better than girls at robotics. But I also learned how to let loose and dance at competitions, have more team spirit than I thought possible, make friends on other teams, and laugh so hard I cried countless times with my team. Now, I go back to competitions to volunteer (both FLL and FRC), and I look forward to the day when I have enough time to mentor an FRC team and help spread the amazing experiences I have had. FIRST will always be part of my life.